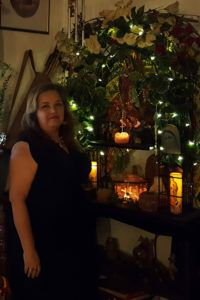 Eric and Katrina offer several types of magical services to the communities both online and in the Sacramento and El Dorado County areas of California. Setting the lights $35.00 – Can’t do the magical work yourself or prefer to have a professional do it for you? 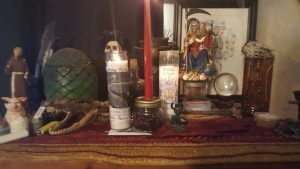 Katrina will perform your candle spellwork and send photos of how the candle looked burning and afterward, as well as a report of the process. The cost is $35.00, which includes the candle. Includes candle, photos, and full report. Please email to discuss your specific situation. Witch’s bottle/Honeypot/Vinegar Jar $35.00 – Let us know what you want to accomplish and we will create a Witch’s bottle, vinegar jar, or honeypot to make it happen. The cost includes a sealed bottle with all appropriate ingredients inside and the execution of the spellwork by us. Includes bottle, ingredients, and instructions. Please email to discuss your specific situation. 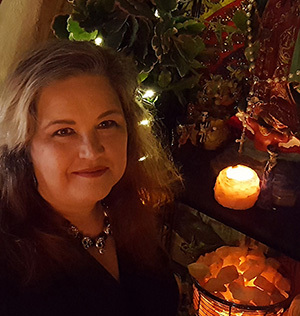 Katrina performs in-person consultations, limpias, and Tarot readings at LightWeavers Academy in Citrus Heights, California. 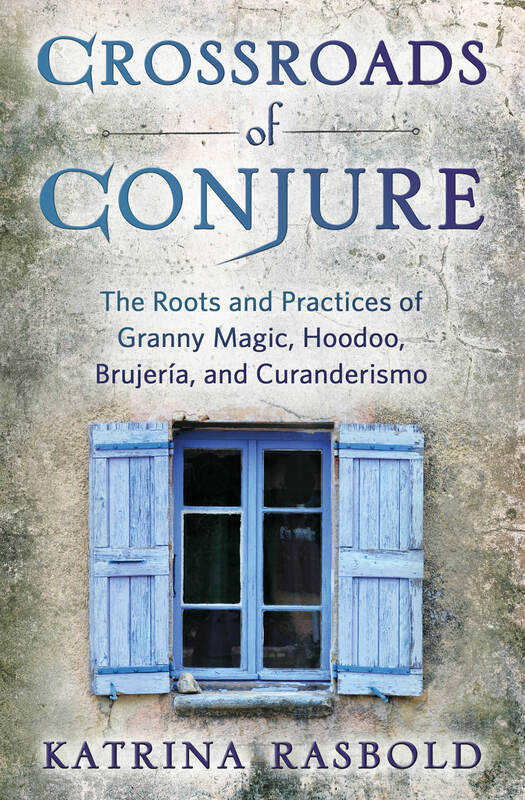 She offers a 12-month series of classes on the sacred art of Brujeria to a select group of students each year, both at LightWeavers and online. She also teaches online Tarot classes. For more information about the classes Katrina teaches, some with her husband, Eric, go to www.sovereigntyworkshops.com. Katrina and her apprentice, Marti, book limpias (a limpia is an extensive cleansing and healing) from 1-6pm at LightWeavers on Sundays. Go to the link above to book your session. They are sometimes available for walk-in bookings, but usually book up in advance, so please schedule ahead of time whenever possible to secure your session time. To book a consultation or a limpia at LightWeavers, click here. To book a consultation or a face-to-face Tarot Reading at LightWeavers in Citrus Heights, CA, click on this link. To book an online remote Tarot reading (by video link) click on this link. If you choose to burn your own candle rather than having Katrina do the spell work for you, she will still interpret your candle burn if you wish. Send quality photos of the candle post-burn to Katrina at this email address, as well as the purpose of the spellwork in which you used the candle, and submit the $10.00 payment (per candle). Katrina will read the burn and email you back with her interpretation. 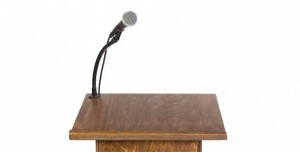 Katrina is available for public speaking and lecturing on a variety of different metaphysical subjects. She also teaches classes in groups of five or more upon request. Please email to discuss. 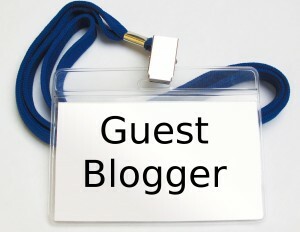 Going on vacation and need someone to step into your blogging shoes? Katrina has been an online blogger since 1998 and has a working knowledge of a number of different subjects. Drop her a line and see if she is open to writing about your topic. 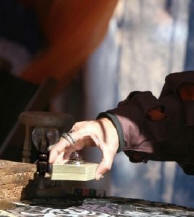 Katrina is available to perform Tarot readings for parties and events at a cost of $100 per hour. Email for details. Please note that she does not dress in gypsy-wear and work from a “fortune-telling” perspective. Her consultations are moving, intuitive experiences designed to help the client identify obstacles to their success and chart a course for greater joy and abundance in life. Katrina Rasbold has provided insightful, accurate and helpful life path consultations to clients for over thirty years. She has worked with teachers and mentors all over the world, including three years of training in England and two years of practice in the Marianas Islands. A lively and articulate instructor, Katrina is available for workshops, individual classes and speaking engagements tailored to fit the needs of her students and clients. She is a professional life coach who holds a Ph.D. in Religion with a minor in Psychology. She and her husband, Eric, are co-creators of CUSP (Climbing Up the Spiral Pathway), a program designed to manifest positive, long-term life changes by following the ancient agricultural cycles throughout the year. 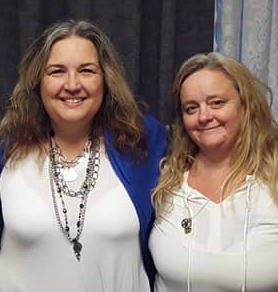 CUSP has touched the lives of literally thousands of people since its inception in 1997 and is practiced as a life pattern and spiritual path all over the United States and in other countries as well. She has written thirty-five books, all available on Amazon.com. Eleven of those books she co-authored with Eric. Katrina and Eric are a popular presence at many festivals and speaking events throughout California for many years, including PanGaia Festival, Sacramento Pagan Pride, and Pantheacon. She is a published author and freelance journalist who has distinguished herself with her no-nonsense approach and humorous, home-spun commentary in many different genres of reporting and commentary. Her workshops, classes, and lectures continue to charm and educate her clients and students. Katrina and Eric have six adult children and live in a remote mountain community in El Dorado County, California. They are the owners of Two Sisters Botánica, an online shop offering their handmade magical products. 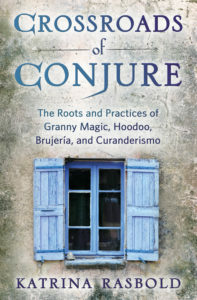 They teach classes through Sovereignty Workshops and at LightWeavers Academy in Citrus Heights, California where Katrina works as a practicing Bruja.